It was November when I received an email from black belt Mark Vives out of Chicago, IL. He apologized for not making it to our Chicago BJJ Open the previous month, but wanted to do something special for us. He had an idea: 12 seminars at 12 different schools in the Chicagoland area across 12 days in December. “I have never trained anywhere close to 12 days straight in my 10 years of BJJ, no less hosted 12 seminars,” I said. But Mark was game. He already had the schedule nailed down. All I had to do was make the fundraising website. It’s always hard to say how much events like these will raise. From time to time we’ve had people host seminars and Grapplethons to benefit Tap Cancer Out, but never 12, and certainly never consecutively. But night after night, Mark would update me on the cash donations he received, and the online donations were piling up on the fundraising site too. $635 from Crossover BJJ. $475 from Core Combat Sports. $1,200 from ROL Academy. I’d be lying if I said I wasn’t stunned at how well the seminars were doing. I should have learned my Chicago lesson when the city absolutely obliterated our tournament records raising $91k in the first year. $515 from Vianna Bros BJJ. $910 from Team Redzovic. $380 from Team Fumaca. $705 from Alliance/Evolution MMA. Okay…this was getting crazy. It was the holiday season and I was coming off a brutal 8 consecutive weeks of traveling, but I had to see this for myself. Originally one of our Volunteer Ambassadors, Shaun Richmond, was slated to attend Mark’s final seminar at New Breed Training Center to accept the “big fat check” on behalf of Tap Cancer Out. But this was going so well that I decided to fly out myself. $330 from F2Defend. $480 from Soul Fighters. 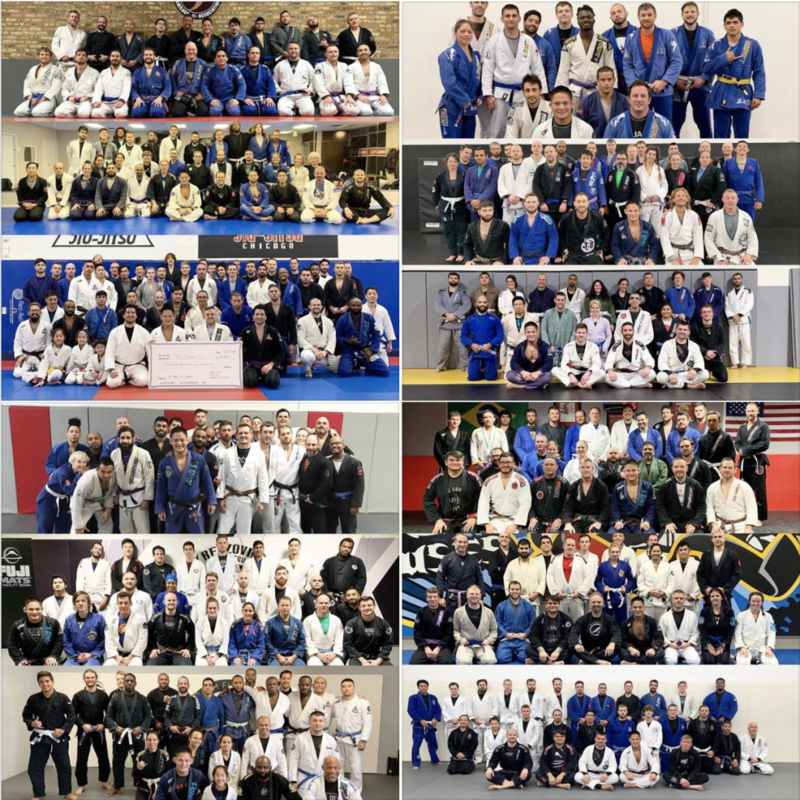 $160 from Serafin BJJ (though most of those students were savvy to our fundraising platform and donated online since they were our #2 Fundraising Team at our Chicago tournament). When I arrived at New Breed with Shaun and the gang from Carlson Gracie Team, I tried to blend in. I wasn’t sure if Mark knew what I looked like or not. He walked up to our group as we were filling out waivers, said hello, and continued by, with no idea who I was. I quickly changed to my Tap Cancer Out x Inverted Gear Gi, walked out onto the mat, and introduced myself. He was definitely surprised, giving me a curious look as the wheels spun in his head! He taught a really interesting crucifix series and we had some great rolls afterwards. I even came back the next day for a brutal but fun open mat…and the coldest shower I’ve ever taken in my life (I’ll let you ask Mark why he intentionally took a hammer to his hot water heater). Mark’s amazing selflessness along with the generosity of his sponsors, donors, and the hundreds of students who attended one or more of his seminars has humbled us all at Tap Cancer Out for sure. At the end of the seminar, Mark, along with his partners Nick from BJJ Tees, and Lee Zeidman from Zeidman and Associates (who donated $2,500 themselves), presented me with a “big fat check.” Sadly, it wouldn’t fit in my carry-on, but hopefully they’ll hold onto it and we can do this all again next year! 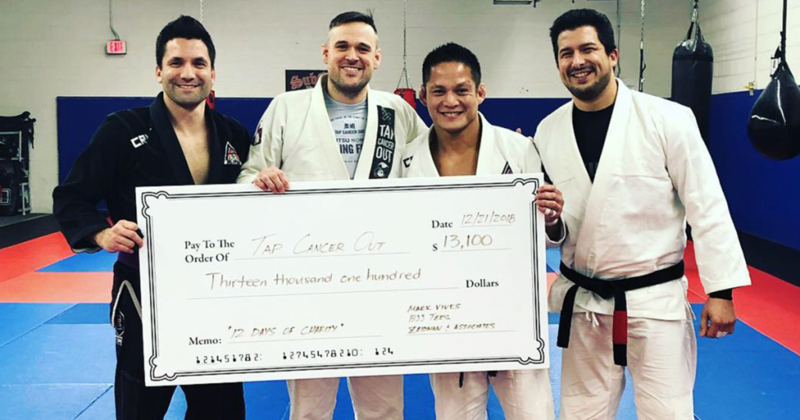 When all was said and done, the Chicagoland BJJ community raised $13,371 on behalf of Tap Cancer Out to benefit Alex’s Lemonade Stand, making Mark’s seminars the single-most successful volunteer-hosted event series ever hosted on our behalf. Thanks again to all who made it happen!